Temperatures yesterday were quite something - low here at house was again 32 F but high at airport reached 82 F, so a diurnal swing of around 50 F for parts of the metro area. - 26 C (44 C colder than here). Below shows the plot of 12 UTC 500 mb observations, indicating an anticyclone nearly overhead, with heights of 5850 m here and at San Diego. But south of Hudson's Bay, the cold vortex has heights below 5100 m - again an extreme difference. Good to be in Tucson this morning and not the Northeast. The WRF forecasts from ATMO at 06 UTC last night indicate the arctic air battles with our mild desert air masses will remain over in eastern new Mexico (above WRF-GFS temperature forecast valid at 12 UTC on January 1st, 2018). Seems like every morning I have to go to Jack Hales webcam wall to find something interesting. 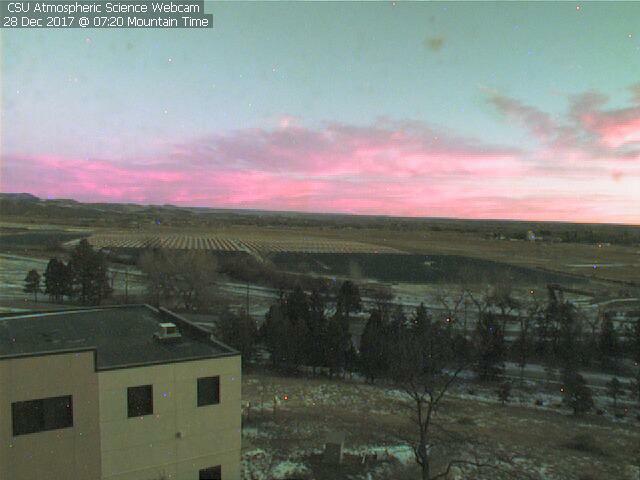 Above is view from Atmospheric Science building at CSU in Ft. Collins, Colorado, showing a pink sunrise and a skiff of snow cover. At bottom is brilliant red/orange sunrise at Mt. 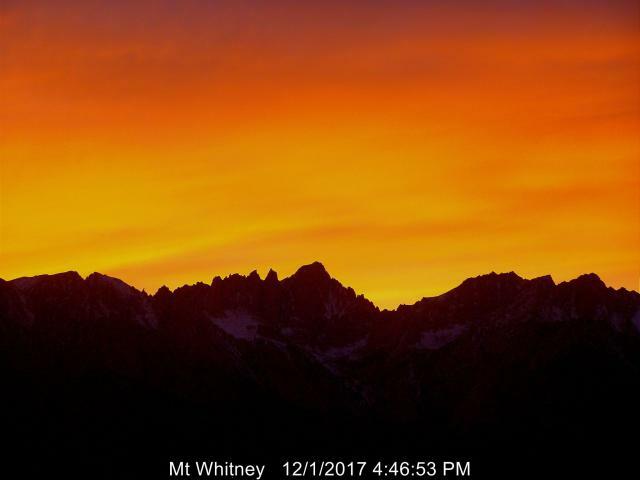 Whitney, California. The GEFS ensemble forecasts indicate little change from our ho-hum pattern. Above is 12-hour forecast for 500 mb mean and spaghetti valid at 12 UTC this morning, while below is same at 168-hours (00 UTC on 4 January). Second below is the operational ECMWF 500 mb forecast valid at 00 UTC on 4 January. These forecasts indicate that the icebox of the Northeast may may tighten its hold on the East and extend southward into Florida. While the GEFS PW plumes from 06 UTC (below) seem to indicate that the most challenging forecast for TUS would be getting the PW within a tenth of an inch during second half of coming week. 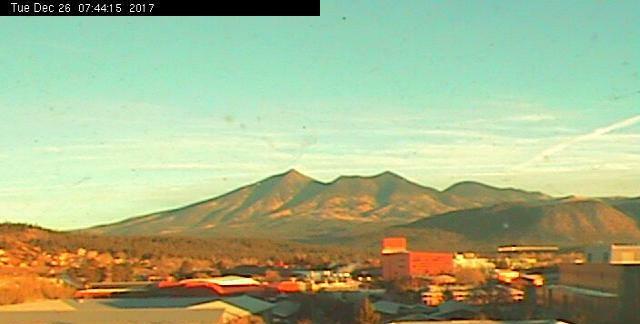 Some webcam images this morning (thanks to Jack Hales webcam wall) - Old Faithful above with lone, hardy soul, and the San Francisco Peaks from Flagstaff below. 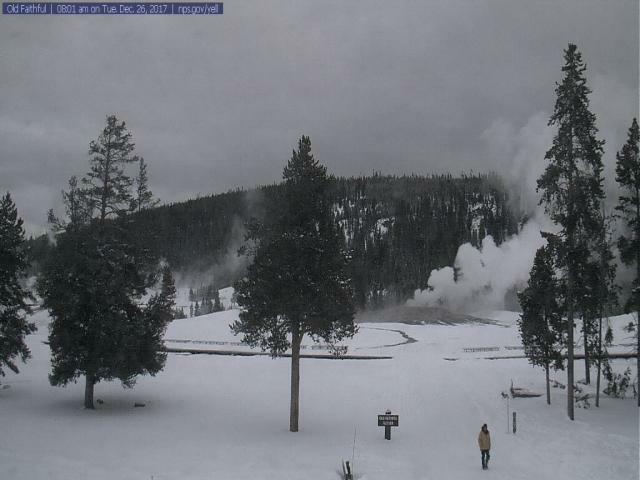 The snow drought in northern Arizona obviously continues. 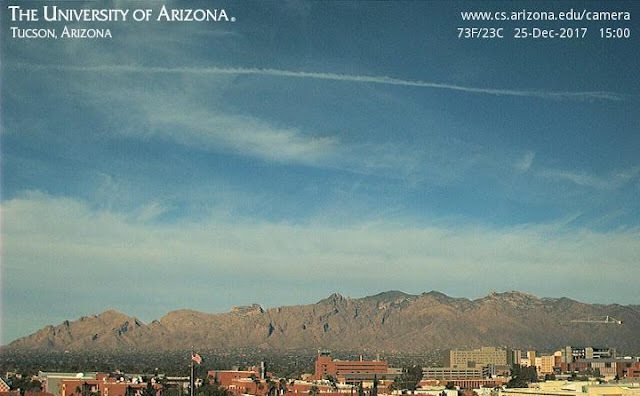 Here in southern Arizona the lack of meaningful rain/snow continues as the year winds down. Mornings have been cold, but afternoons have been in mid-70s and very nice. The morning lows here at house for last 5 days have been: 19, 25, 28, 30, and 28 F.
The GEFS 500 mb average and spaghetti plots above are valid at 5:00 pm MST on New Year's eve. The West Coast ridge continues, while the East Coast, cold trough remains, keeping the nasty weather and frigid temperatures in play for much of the East. 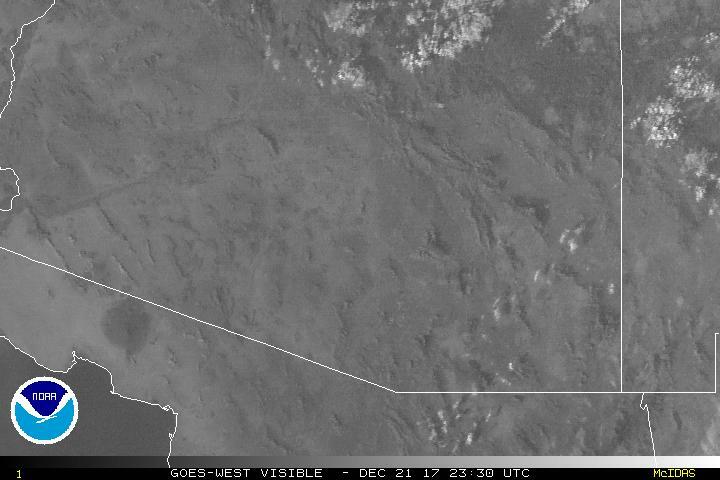 Not much spaghetti, even at 144-hours, with most of that over the eastern Pacific and western third of continental U.S.
Below is view of Catalinas at 3:00 pm on Christmas - note the temperature in upper right. 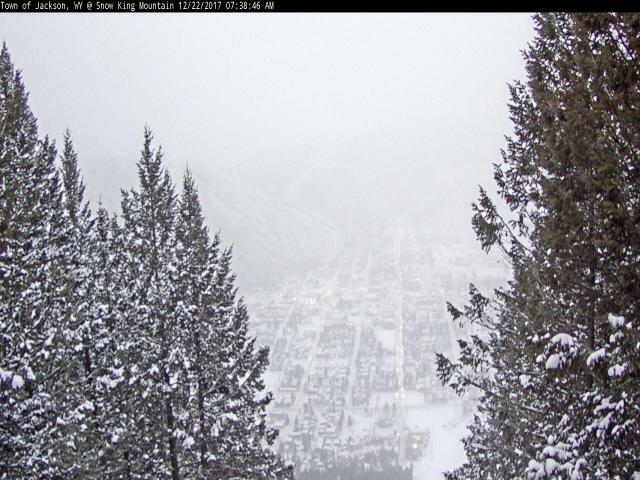 A Christmas kind of view of Jackson, Wyoming this morning. Hope that everyone has a great Holiday weekend - keep warm. From MesoWest (Univ. of Utah) temperatures at 7:30 am MST this morning - above southeast Arizona and below metro Tucson area. Definitely a hard freeze underway most locations. Temperature here at house, along the Rillito wash, was 19 F at 7:00 am. The cold site west of Tombstone was reporting 7 F! Yesterday afternoon the NWS radar was tracking a large plume of chaff emanating from the Goldwater Ranges - first that really caught my eye in quite sometime (above image from about 4:30 pm and there is a second small plume northwest of the large echo area). Concurrent visible satellite image shows mostly clear skies. 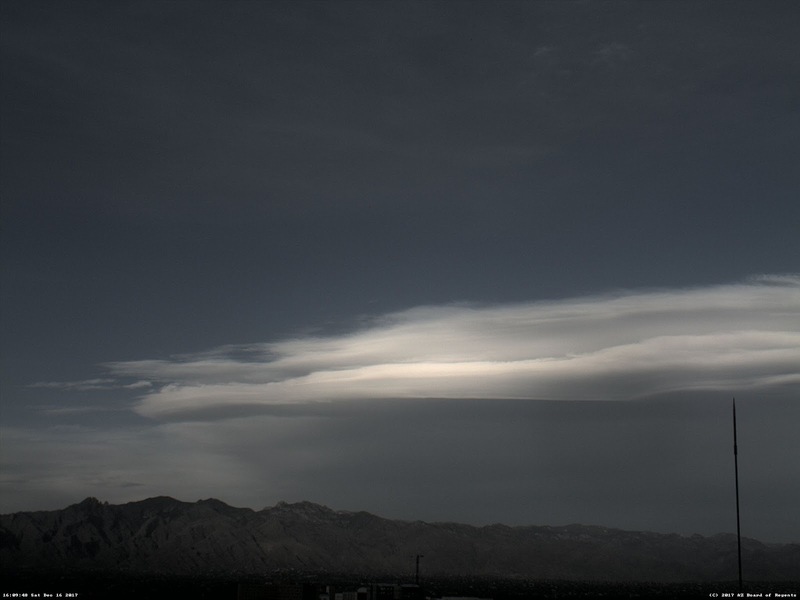 Safford was reporting a strange surface observation at this time - light rain and clear skies see obs at bottom. There is a large and very cold closed low at 500 mb over the Great Basin (above) this morning. Model forecasts bring this system southeast but also forecast it to weaken rapidly. The matching 850 mb analysis (below - both from SPC) shows an arctic front over the Plains and a pronounced cold front over the Southwest, which will come by here later today. The MIMIC (from the Univ. of Wisconsin) total precipitable water analysis for 6:00 am MST (second below) shows that very dry air prevails, as this system moves toward the Southwest. The NWS has issued a hard freeze warning (temperatures of 28 F and colder for several hours) for the early morning hours tomorrow. Here at house, in north part of the City, we have already had two hard freezes - the coldest of which (back on December 9th) took down a 7 ft tall prickly pear at lowest point of backyard. Looking ahead to Christmas, I've shown 4 panels from the 00 UTC GEFS forecast system - 500 mb above and surface plus precipitation below. Both are valid at 12 UTC (5:00 am) on Christmas Day. Model forecasts weather for the day only over the Northeast and the Northwest. The WRF-GFS forecast from Atmo at 00 UTC (bottom valid thru 5:00 pm on Christmas) forecasts continued over part of the Southwest. Light showers around the metro area this morning (above composite radar from 7:15 am MST), with heaviest echoes over or near the airport. The ASOS at the airport seems to have had problems beginning early yesterday - system reports a total of only 0.02" early yesterday am and then nothing since. Was raining lightly here before sunrise. Above and below show event rainfall totals from ALERT ending at 7:00 am this morning. Generally amounts at lower elevations ranged from a quarter to near half an inch. Heaviest amounts were in southern half of network where 3 sites had more than half an inch. Total amounts unknown at many higher elevation sites because of snow or rain/snow mix. Our total here at house was 0.38" before the morning showers - that amount is 0.01" greater than the total here since August 13th, which highlights the extended dry period. Most of the rain here (0.35") fell as two morning bands of moderate to heavy showers passed by, ending before noon. Nogales reported a total of 0.75" with some thunder yesterday. The lightning flash density plot at bottom (from weather.graphics and Vaisala for past 48-hours) indicates some isolated thunderstorms occurred near and east of Tucson. Global models diverge after mid-week and it's not certain what we may get for weather on Christmas. But, the coming week will continue unsettled and cool, with two fronts probably coming by - one from northwest and then one from the east. Some snow at Summerhaven General Store this am. Rain here at noon was up to 0.35" - making this easily the most rain on a day since August 13th. Computer problems here due to power surges - ugh. Photo from ATMO cam yesterday showing lenticulars over eastern Catalinas at 4:00 pm MST. Below is ALERT rainfall for past 6-hours ending at 8:00 am - 100 percent coverage already with amounts in metro running a tenth to a quarter of inch. Composite radar at 8:15 am (above) indicates another band of moderate to heavy showers approaching Tucson. Image below (from weather.graphics and Vaisala) shows detected CGs for past 12-hours through 8:00 am. Considerable thunderstorm activity surround the closed low that is over northern Baja or GoC. Yesterday was cold here at house with a low of 36 F sometime before the east winds started, which was before sunrise. Winds were surprisingly strong here in this part of town with some blowing dust and gusts 35 to 40 mph between about 8:00 and 11:00 am MST. Rainfall here has been almost non-existent since August 13th when there was 1.16" - since then the two heaviest rain days were August 26th with 0.14" and September 7th with 0.11". Even though tomorrow's system will be short on moisture, it will still bring a chance for the heaviest precipitation event since mid-August, so that makes it a pretty big deal. The 06 UTC plumes of forecast PW (above) from the GEFS for TUS indicate a significant increase from this morning to maximum amounts over 0.50 inches tomorrow afternoon. This occurs because the current forecasts dig the closed, 500 mb low a bit west of northern Baja, allowing the system to pick up some moisture from the south before it swings eastward. The plumes for rainfall at TUS (from the same run of the GEFS - below) show that all of the members forecast measurable rain at the airport, but with amounts ranging from 0.02" to about 0.40". The amounts here will depend very much on the exact track that the 500 mb low takes. The 06 UTC WRF-GFS from Atmo forecasts the most significant radar echoes over Pima County to occur during early afternoon tomorrow (above forecast of composite radar echoes valid at 1:00 pm). That model run currently forecasts the 500 mb low to pass nearly overhead (below valid at 7:00 pm tomorrow) with temperatures colder than -20 C. The model forecasts of QPF from this run are only a tenth of an inch at TUS, but are over an inch at Nogales and Sierra Vista. Will be very important to see the details of exactly where the system moves tomorrow. An interesting weather event shaping up for the weekend: wind, then some precipitation, then cooler into week heading up to Christmas. The GEFS QPF plumes, above from 00 UTC last evening, have almost all members forecasting some rainfall at TUS on Saturday night and Sunday. The big spread is in the amounts forecast, which range from a Trace to almost 8/10 of an inch. Ensemble average keeps amounts fairly light, yet again. Once again the operational GFS appears to have had the trends forecast better than the ECMWF, which continues to show considerable variability between 12 and 00 UTC intialized forecasts. The operational GFS forecast for 500 mb is shown above - from 00 UTC last evening and valid at 00 UTC on 18 Dec (Sunday afternoon at 5:00 pm MST). The model's precipitation forecast for period ending at same time is below. The big uncertainty remains as to how much moisture the digging, mostly overland, short wave can tap. The MIMIC TPW analysis below is valid at 14 UTC this morning with higher PW amounts pushed way to our south - so moisture availability is likely to be limited, and this now looks to be the key factor to watch as the weekend event unfolds. Global models have considerable differences for the Southwest by Sunday afternoon - above is GFS operational 500 mb forecast valid at 5:00 pm MST Sunday, while below is same forecast from operational ECMWF. The GFS digs the 500 mb shortwave as a single feature that closes off nearly overhead with much lower heights and temperatures. However, the ECMWF splits the short wave into two pieces, with one closing off over Baja and the other crossing Colorado. Both models bring a front through Arizona, but the GFS would support at least a chance for rain/snow showers in our part of state. The GEFS spaghetti plot for 500 mb valid at same time as other forecasts indicates maximum uncertainty in the ensemble members nearly overhead - thus, something to watch and also another head-to-head between operational versions of the two global models. Very nice sunrise this morning. Wasn't paying attention yesterday and didn't see that 12 UTC WRF-GFS on the 11th was forecasting another period of strong easterly winds. Forecast above is from 06 UTC WRF-GFS and is for 10-m winds at 11:00 am MST this morning - yesterday morning's forecast was quite similar. Below is forecast sounding for Sonoita from 06 UTC today and valid at 11:00 am. - it is an excellent set-up for more strong gusts at the Mt. Hopkins RAWS station with gusts well above 50 mph possible. Bottom graphic shows winds and gusts so far this morning at that site. Peak gusts at this site for last six days have been: 78, 73, 60, 45, 20, and 55 mph.